Is Body Mass Index a Factor Affecting Peroperative and Early Postoperative Complications in Laparoscopic Rectal Cancer Surgery? Objective of the study: Obesity is becoming widespread especially in developed countries. Besides its adverse effects, obesity could complicate the treatment of additional pathologies. 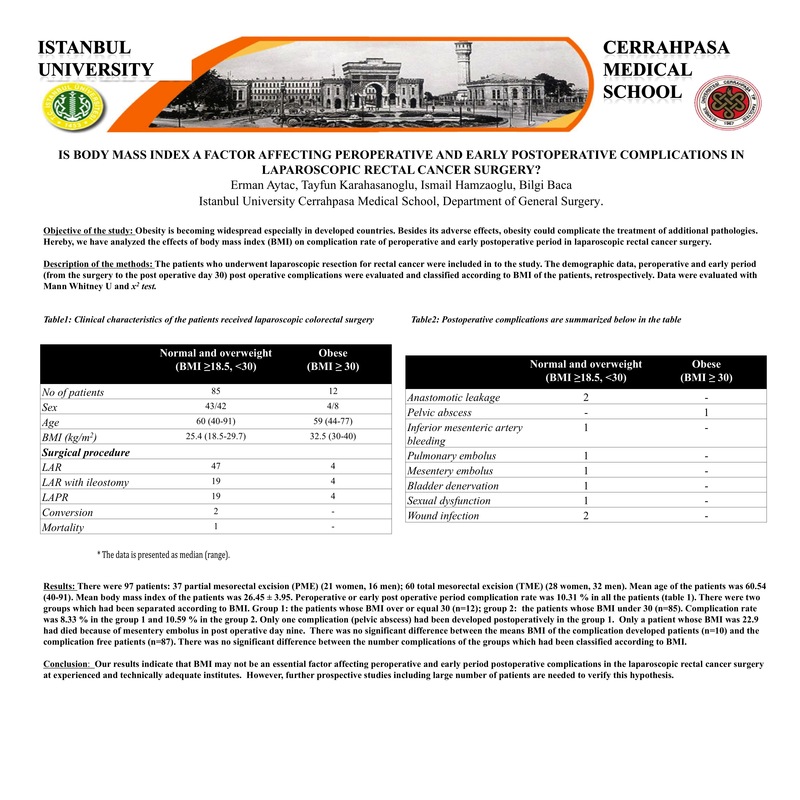 Hereby, we have analyzed the effects of body mass index (BMI) on complication rate of peroperative and early postoperative period in laparoscopic rectal cancer surgery. Description of the methods: The patients who underwent laparoscopic resection for rectal cancer were included in to the study. The demographic data, peroperative and early period (from the surgery to the post operative day 30) post operative complications were evaluated and classified according to BMI of the patients, retrospectively. Data were evaluated with Mann Whitney U and x2 test. Results: There were 97 patients: 37 partial mesorectal excision (PME) (21 women, 16 men); 60 total mesorectal excision (TME) (28 women, 32 men). Mean age of the patients was 60.54 (40-91). Mean body mass index of the patients was 26.45 ± 3.95. Peroperative or early post operative period complication rate was 10.31 % in all the patients (table 1). There were two groups which had been separated according to BMI. Group 1: the patients whose BMI over or equal 30 (n=12); group 2: the patients whose BMI under 30 (n=85). Complication rate was 8.33 % in the group 1 and 10.59 % in the group 2. Only one complication (pelvic abscess) had been developed postoperatively in the group 1. Only a patient whose BMI was 22.9 had died because of mesentery embolus in post operative day nine. There was no significant difference between the means BMI of the complication developed patients (n=10) and the complication free patients (n=87). There was no significant difference between the number complications of the groups which had been classified according to BMI. AL: Anastomosis leakage; PA: Pelvic abscess; BD: Bladder denervation; IMAB:Inferior mesenteric artery bleeding; SD: Sexual dysfunction; C: Conversion; PE: Pulmonary embolus ME: Mesentery embolus. * The patient died as a result of massive mesentery embolus. Conclusion: Our results indicate that BMI may not be an essential factor affecting peroperative and early period postoperative complications in the laparoscopic rectal cancer surgery at experienced and technically adequate institutes. However, further prospective studies including large number of patients are needed to verify this hypothesis.